Drawing on the power of place, Bird Creek Ranch seeks to nurture the potential of all within its bounds, in the process strengthening the connections that link people to each other, to the working land, to nature, and to their own personal landscapes. >Provide opportunities to help others find and preserve the power of their place. For over 140 years, Bird Creek Ranch has been on the frontier--the frontier of place and the frontier of ideas. The ranch is located along approximately three miles of the Missouri River in lower Chestnut Valley, a place rich in history. The area was shaped by a volcano and a large glacial lake that reached depths up to 600 feet. Ancient peoples came searching for food and shelter, and the ranch’s rolling hills provided grass for bison, antelope, and deer. The brushy creek and river bottoms sheltered animals and early humans. Lewis and Clark traveled along the ranch’s river boundary as they trekked to the West Coast. Later, U.S. Army patrols, on their way from Fort Shaw to Fort Logan, forded the Missouri here. Jemison Perkins, an ox-freighter, wintered his oxen in the brushy area where Bird Creek flows into the Missouri River. He built a two-room log cabin called the grandest house in the area, named it "Picturesque Brockwood" and added other buildings, six of which are still used. After Perkins' death in 1908, the ranch passed through several owners until Richard Jones, son of Montana pioneer J.H. Jones, created the Bird Creek Ranch boundaries as they exist today. Richard and his wife Freda reclaimed deserted buildings and cleared brush to create rich pasture and farmland. Richard and Freda raised wheat, sheep, and supplied hay for area ranches into the 1970's. A nationally recognized registered Hereford herd carried their historic brands, Wagon Rod and Eleven Bar. Before ecology was a mainstream word, they recognized the uniqueness of this place and nurtured its diverse habitats. In 1989, the ranch was named as a Montana Centennial Site. 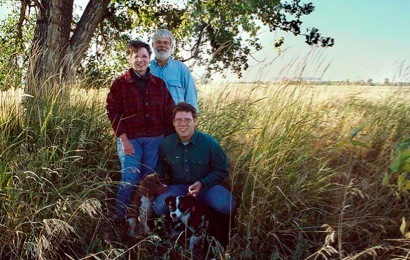 In the 1990's, their daughter Cindy, her husband Jim and son Stephen moved to the ranch. Under their stewardship, a herd of purebred Highland cattle graze the ranch's native grass, along with Icelandic sheep, known for their hardy nature. The family has preserved the open space of this place through a conservation easement, and in 2009 they received a Montana Wetlands Legacy award for their work.